You know fry pies will never go out of style. I wonder if Keith and Laura carry a fry-pie holster of some sort, so you could tote around 3 or 4 with you strapped around your waist at all times (just in case the fry pie munchies hit). I could really see an Amish leather fry-pie holster making a splash. Look, Amish craftsmen are so creative, couldn’t this be next season’s hot item? You know how we North Americans are really into portability with our on-the-go lifestyles. You could even have an embroidered version for the ladies. You heard it hear first! The fry pie just has a lot of things going for it–it’s pocket-sized; the compact “casing” prevents messiness you get with a regular pie; plus, if you’re into it, the surprise factor–unless it’s labeled, it’s hard to tell what flavor you’ve got. How can you beat all that. When I was growing up, you had the Hostess Fruit Pies, in flavors like cherry, lemon, and apple. Was that just the fry-pie concept, taken to a mass-production level? I loved those things, though I hardly ever got my hands on one. Plus I have a feeling the ingredients list would read like a chemical engineering student’s final exam. When I’m in Ohio, I get my fry pies at Hershberger Truck Patch and Bakery. I think of Hershberger’s as the Amish baking mega-plex. Their free coffee keeps you moving. On fry pies, Keith adds: Our friend Paul (the one you met in Michigan) and his wife are big supporters of their children’s Amish school, and their most popular fundraisers involve making and selling fry pies. The parents and kids from the school team up to make more than 3,000 fry pies in flavors like peach, blueberry, lemon, and my favorite, black raspberry, which they sell to the greater community at large. Seems like I’m always visiting either right before or right after a fundraiser, but I sure would like to be there to help make them. I have discovered, however, that more than two at one setting is not a good idea. Too much is too much! I think Keith’s right. Two seems like the sweet spot. With regular pie, I usually max out at two pieces, and I’m guessing one fry pie is about the equivalent of one regular slice of pie. Add your fry pie thoughts, tributes, poems, hot-spots, etc. below! $1.00 each to $2.50 each. My favorite flavor is blackberry. Friday or Saturday of the Sunday that family is to host church. My husband’s eyes light up like a Christmas tree if I surprise him with a fry pie-I just asked what his favorite was and he said “all of them”. My grandma, from the South, made these so I was surprised to see the Amish made them similarly when we moved to Ohio-brought back good memories of Grandma. Here too, the prices sure vary-but it’s amazing how many kinds they make. Living in the Big Valley Amish community in Pennsylvania, I’ve never seen “fry” pies at any Amish bake stands. 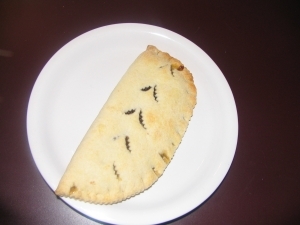 Here is always the regular snitz pies, that often are sold with a different fruit filling, but never fried, always baked. Healthier!!?? I have made Yankee fried pies, with dried fruit. I have not tried to make Amish fry pies. Hard to believe that these humble pies are making such a big splash! Growing up, they were always around, usually fried apple pies or fried peach pies, depending on which fruit you had-with apple probably being the most popular. I think, probably as women made biscuits for their meals, they made enough dough to make the pies. They probably already had the fruit, so it was an economical desert to make-almost cost-free. Today, there is nothing better than a fried apple pie–but it’s become almost a “lost recipe”. That’s why, when I find them, I buy extras. And it makes me SO nostalgic and teary-eyed for my mom, whom I lost two weeks ago. I should have learned more from her on the old ways of making things. So sorry to hear that Loretta. My family loves these they’re everywhere in Middlefield / Mespo Ohio !!! Hmmm… I’m guess I’m going to have a conversation with Loren & Dorcas, our leather experts, to see what might be entailed with producing fry pie holsters. The most important thing is that they must be glaze-resistant! The Snitz pies in the story are called; “Moon Pies”, not fry pies. Fry pies are deep fried while the Moon Pies are baked just like the real pies. Ok so now that my mouth is watwring and wants to try these. Where is the recipe for them? lol. Ok so now that my mouth is watering and wants to try these. Where is the recipe for them? lol. Alright, now that my mouth is watering, why isn’t someone sharing recipes on how to make these goodies!!! Karen, Ianore, I wish I had a recipe to share, but as you can probably tell my specialization is more in 1)eating stuff, and then 2)saying if it’s good or not. It’s taken many years of training to get to where I am in the field, you understand. Hope that entices you to check the rest at the link! Fry, Moon, Snitz...I just want pie! Erik, this post is like an epic poem about Amish “pocket” pies. You certainly seem enthralled, almost obsessed with them. I’d agree, the one in the photo looks baked, not fried. If it’s a Moon Pie, send me a dozen! Blueberry, cherry, blackberry…oh my! This is NOT a good subject for us Diabetics. Why, I’m about to go to the stacks (at the library now) and look for Amish cookbooks. Loretta, please accept my sympathy. I’m so sorry about the loss of your Mom. I lost mine over 30 years ago, and still have questions I wish I’d have asked her. Peace be to you and your family during this difficult time. They remind me a bit of Cornish pasties, except pasties are usually savory. However, back in the day when wives would send pasties down into the mines with their husbands for their lunch, they would make one end savory and one end sweet so they could have their lunch and dessert all in one crusty pocket! I agree with Alice Mary….Fried, Moon, Snitz…just give me pie. Blackberry is my favorite, but hard to find. I haven’t seen any fried pies in the Lancaster area, but I’ll start looking closer. I wonder what the Amish use to fry them in? Erik, I’ve been off line several days due to work; what a laugh I’ve had! Glad I could stir up some memories! And thanks to all of you who commented, too. Folks in MS make fried pies as well. But a dear lady in Randolph makes wonderful home made chocolate ones! Worth the drive. Mmmmm! Lemon, my absolute favorite. Our favorite fry pie baker is the Swartzentruber family just down our road. They make them with every imaginable fruit, and even take special orders ahead of time if you want a lot or certain flavors. Charge $1 apiece. The fry pies around here are often coated in a glaze, making them very sweet and rather heavy – the Swartzentruber neighbor Dad says he can hardly eat a whole one at a time and usually only has half – but we sure can eat a whole one at once! Two, though, would be WAY too much at once, the way they make them. Bob the Quaker, I’ve never seen them in Lancaster County, either. Lindsay, I know exactly what Cornish pasties are as my husband is from the north of England and I’ve been there 8 or 9 times. It seems they do alot of things in ” pie ” form over there! Actually, I have to confess I’ve never had an Amish fry pie, and although I’ve certainly seen them in my travels, I never had the desire to try one as the word ” fry ” just didn’t turn me on. I love all of the regular type pies, though! If you’ve ever eaten a Hostess fried pie, you will love the fresh ones from the Amish….I grew up on fried pies….this is what we called them…mostly apple, because they were plentiful…sometimes dried peach pies yummy………….if you get a chance Debbie Welsh, try one…..especially the peach, they are delicious….probably because of all the fat…..but hey, you probably wouldn’t eat one a year….and it would be well worth the fat….. I used to love the Hostess Lemon ones too…my daughter liked the Cherry….but no, I have never seen them in chocolate…..
Amishrecipes.net, for all those interested in making them themselves. 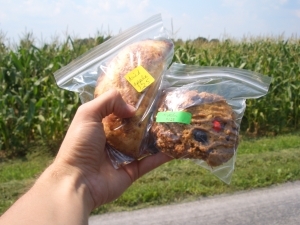 If you would like some Amish Fry pies check your local convenience store or go to www.amishpie.com and have some shipped to you.